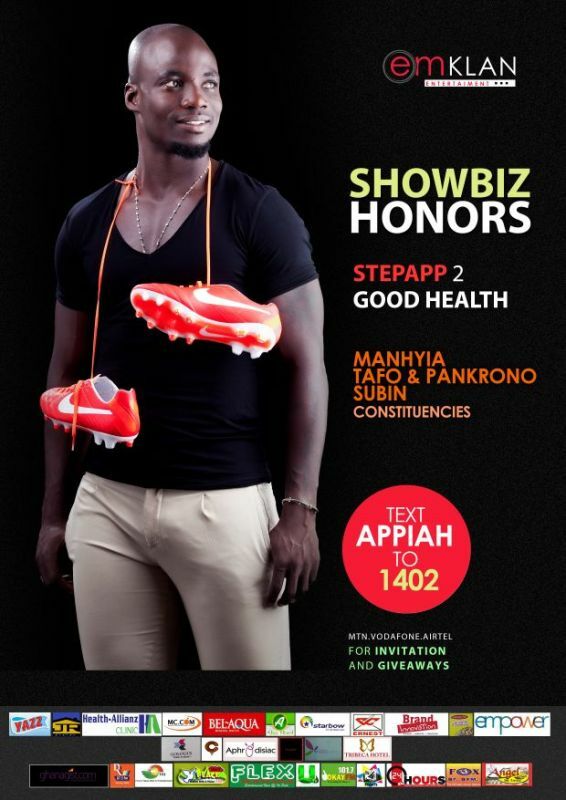 Fans of the former Black Stars’ skipper, Stephen Appiah who wants to witness their icon honoured during the second edition of the “Showbiz Honors” can text “Appiah” to MTN, Vodafone and Airtel shortcode 1402 to get the chance to be invited to his honouring in December, according to Stacy Amoateng, the brain behind the event. According to Stacy Amoateng, since the honouring event would be strictly by invitation, they are giving the opportunity to loyal fans of the former skipper to be part of the event. “Over the years Stephen Appiah has influenced a lot of lives. People love him, so we are giving few people the opportunity to get something from him. So when you text Appiah to 1402 and randomly you could be called that you have won a souvenir from the sponsors or won a date with Stephen Appiah. So he will take you out, you can ask all your questions and have all the pictures with him,” she said. “And because the awards night is strictly by invitation, it’s to give people the opportunity to get free invitation to the event. We are also working on giving the highest texter a plot of land,” she added. Stephen Appiah is loved and appreciated everywhere in the country being the first captain to qualify Ghana to her first World Cup. As part of the activities for his honouring kind courtesy Health Alliance and Ernest Chemist, his foundation, StepApp Foundation, which focuses on education and quality healthcare delivery, Stacy disclosed, will hit the Kumasi Township with ‘StepApp 2 Good Health Campaign’. The campaign will take place at Manhyia, Tafo-Pankrono and Subin Constituencies and will be supported by some of his celebrities friends; Jael Wiafe, Becca, Jon Germain, Roselyn Ngissah, Nadia Buari, Nana Ama McBrown, Whitney Boakye-Mensah, Eddie Nartey, Gloria Safo, Ayesha Passah among others. Kumasi based actors will also be there in their numbers to celebrate the former captain. After the health screening, courtesy Emklan Ghana, a workforce agency will meet the youth, have one on one interaction with them and give them career guidance. The former Juventus playmaker was unveiled last year as the honouree for the second edition of the ‘Showbiz Honors’, after Nadia Buari was honoured in the maiden edition. 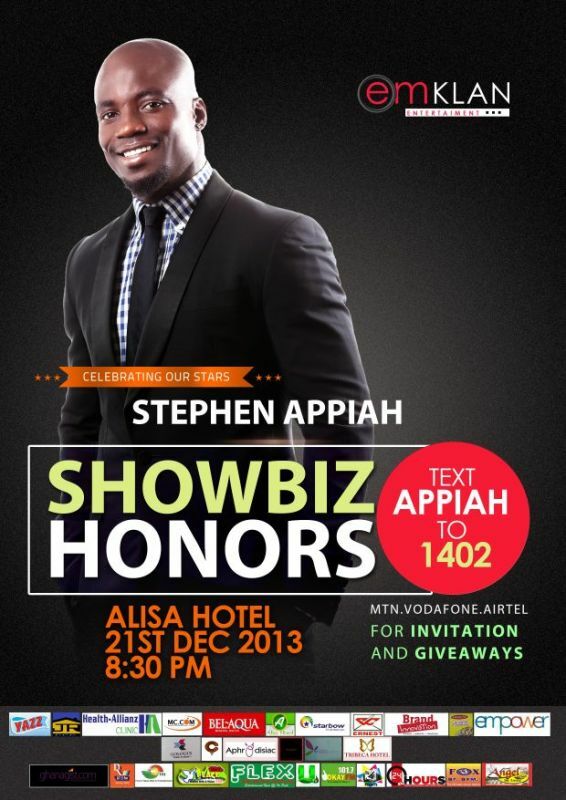 Celebrating Stephen Appiah: Win a ticket for Showbiz Honors 0 out of 5 based on 0 ratings. 0 user reviews.